The destruction of the hard outer layer of teeth is known as tooth decay. Tooth decay can occur at any age. Excessive intake of sugary drinks or foods causes plaque, a sticky bacteria, producing an acid that attacks tooth enamel. The stickiness of the plaque keeps these acids in contact with teeth and over time the tooth enamel breaks down and cavities start forming. Generally, cavities are more common among children, but cavities also form with aging. Recessions of the gums or gum diseases are more exposed to plaques and are more likely to form cavities. Tooth roots are covered with a soft tissue called cementum, this tissue is more sensitive to touch and to hot or cold. For people above the ages of fifty, tooth root decay usually occurs because of this sensitivity. 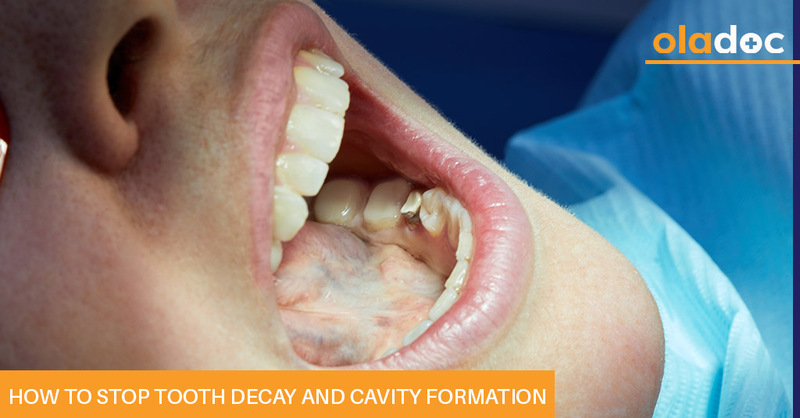 Decay around the edges of fillings is also common for older adults. Because cavities are usually filled with the provided modern preventive dental care but over the time these fillings may weaken and leak around the edges, bacteria accumulate in these tiny crevices and lead to tooth decay. While there is no true tooth decay cure, there are treatment options. Sometimes, a bad tooth is removed or a decayed portion is removed and the cavity is filled in or in case of dead nerves root canal is suggested by the doctors. The most important thing is to avoid tooth decay and make sure you keep smiling! Brush your teeth at least twice a day with a fluoride-containing toothpaste after each meal and especially before going to bed. Clean between your teeth daily with dental floss or interdental cleaners, such as the Oral-B Interdental Brush or Sulcabrush. A fluoride-containing mouthwash is a best choice in this regard. Some rinses also have antiseptic ingredients to help kill bacteria that cause plaque. Eat nutritious and balanced meals and limit snacks. Try to avoid candies, pretzels and chips, which can remain on the tooth surface. Such foods stick on the tooth surface and attack tooth enamel and form cavities. Ask your dentist about the use of dental fluoride as it strengthens the teeth. Ask your dentist about dental sealants (a plastic protective coating) applied to the chewing surfaces of your back teeth (molars) to protect them from decay. Visit your dentist regularly for professional cleanings and oral exam. Ask your doctor about several materials that slowly release fluoride over time, which will help prevent further decay. Use medically recommended toothpastes and mouthwashes that can reverse and heal early cavities. Oral-B electric toothbrush is best in removing plaque and help in preventing cavities from forming in the first place. Take green leafy vegetables as they have calcium in them which decrease the amount of acids in saliva. Eat high fiber foods like fruits, dates, raisins and fresh fruits like bananas, apples and oranges and figs. Visit your dental professionals for a checkup twice a year. Professional cleaning and polishing do not only give you a bright smile but also remove stubborn plaque and tartar. A thorough check up will reveal small issues so you can get your problem solved. Our expert doctors and dentists are here to detect any issue which a naked eye can’t. Seek their advice to get best oral care products for you. You can book an appointment with top dentists from Lahore, Karachi and Islamabad through oladoc.com. You can also call our helpline at 042-3890-0939 for assistance to find the right doctor for your health concerns.